When we talk about pure water, we usually think ‘clean’ and ‘fresh’. This is great for drinking, and the principle marketing tactic of the vast majority of bottled water companies. However, in order to guarantee the accuracy of our results in laboratory experiments and ensure the high-quality production of various materials (such as semiconductors, pharmaceuticals and photovoltaic cells) we need to stick to some much stricter specifications for purity than ‘clean’ and ‘fresh’. Elements and compounds such as sodium, calcium, or copper – even present in the parts per billion range – could interact with samples, active media or system components. This means, unfortunately, if you’re running a lab, even Mount Franklin or Voss isn’t going to cut the mustard. You can’t use ‘pure’ water. You’re going to need ultrapure water. Water dissolves more substances than any other liquid around. Hence, it’s known as the ‘universal solvent’. The chemical composition of water is what gives it this unique attribute. The Oxygen atoms that make up H2O are positively charged, whereas the Hydrogen atoms are negative. The structure of their arrangement means that they line up end-to-end in a polar fashion. This allows water to attract many different types of molecules, and rip them apart by disrupting the attractive forces that keep them together. Ergo; dissolving them. Just take a look at our oceans. Salt (Sodium Chloride), is dissolved readily in water. H2O molecules separate the bonds between the Sodium and Chlorine atoms, creating a solution of salt and water. As salt is quite a common molecule, and water is such a fantastic solvent, the salinity of our oceans is now, on average, 35 parts per thousand. That means for every liter of water, there’s approximately 35 grams of salt. Even more surprisingly, water could happily dissolve 9 times more salt (if it was available) before it became saturated. That’s about a third of its own weight. Now we know how readily water will take up impurities, let’s take a look at how we define ‘purity’. For laboratory uses, water purity can be assessed using a range of techniques – depending on what the water will be used for. However, most commonly, purity is measured through resistance or conductivity. Contrary to popular belief, water isn’t actually conductive. It needs suspended metals and ions to help it pass a charge. The more impurities in the water, the greater charge it can conduct. I.e: the lower the conductivity the more pure the water is. Thus, most water purity standards are measured by their resistance, usually measured in milliohms per centimeter (MΩ.cm). Type III is clean – but it’s not technically ‘purified’. This grade of water is generally used for non-critical applications like rinsing glassware, filling water baths, and feeding autoclaves and other sterilisers. Type II water doesn’t quite reach the standards of ‘ultrapure’, but it’s still pure enough for general lab use. This is generally what is used to prepare medias or buffers. Ultrapure water, by definition, only contains H20 and H+ (Hydrogen) and OH- (Hydroxide) ions. Everything else has been completely stripped away. 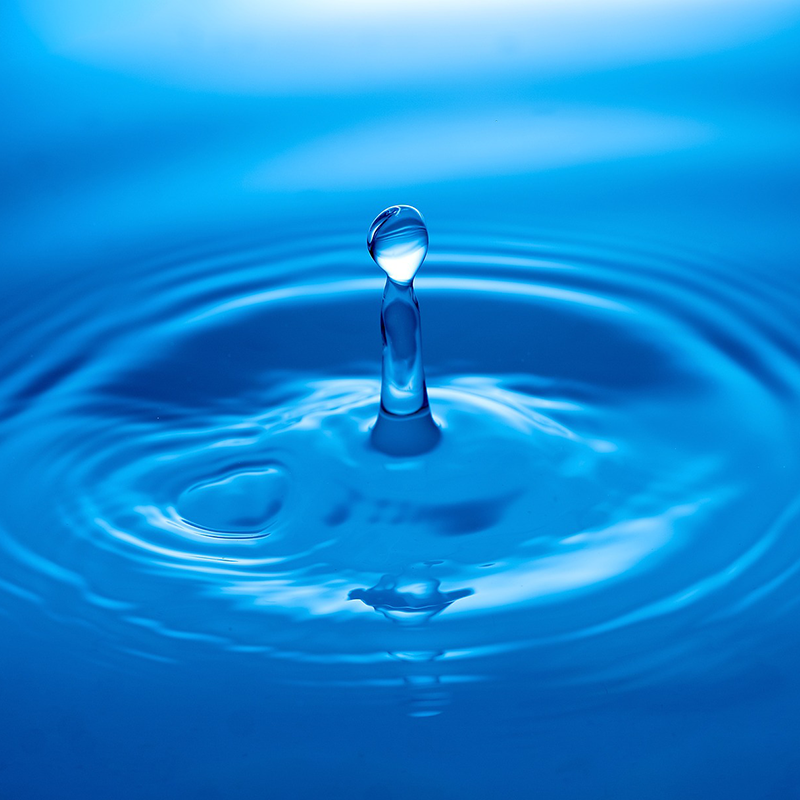 Type I water is used in manufacturing, as well as laboratory applications such as spectroscopy, spectrometry, histology, and more. If you want ultrapure water – just water; nothing else – you’re going to need to put it through some pretty serious treatment to remove any unwanted ions or impurities. That means following one, or a few, of these methods. ‘Osmosis’ describes the tendency of solvents to move through semipermeable membranes from solutes with a higher concentration into solutes of a lower concentration. For example, water molecules inside a cell will travel through the cell wall when it’s submerged in saltwater. And if a cell is submerged in freshwater, water molecules move into the cell if the water inside is saltier. Through this naturally occurring mechanism plant roots take up water from the soil, our intestines absorb water from a can of coke, and slugs shrivel up if you pour salt on them. However, it is also possible to reverse osmosis with a technique called… well, ‘reverse osmosis’ (or ‘RO’). Using a lot of mechanical force to push a solvent with a high solute content (i.e; saltwater) through a filter can help to remove any particles too big to fit through the gaps. It’s much the same process as removing rocks from sand with a sieve – but on a much smaller scale. With some pressure and a semipermeable membrane with just enough room for water molecules to squeeze through, you can essentially filter out the sodium and chloride ions in salt water. You’re left with pure water and a waste brine solution. Another method of purifying water is by passing water through an ‘ion exchange resin’. The resin is used normally in the form of small, porous beads. This gives the resin a high surface area, and helps water pass through easily. Different resins will be coated in negatively or positively charged desirable ions (anions and cations, respectively). As the water passes through the resin, unwanted ions are ‘swapped out’ for more desirable ions, such as Sodium or Chloride. The resulting water can then be passed through reverse osmosis to easily remove the remaining impurities, giving you much more pure water than reverse osmosis alone could have achieved. However, because of the nature of the process, the resin materials will become depleted over time. When the resins are ‘full’, they become unable to exchange ions any longer, and will need to be ‘cleaned’, ‘recharged’ or simply replaced. The last, and perhaps most effective method of purifying water is through Electrodeionization (EDI). Most commonly, this is done through Merck-Millipore Elix® Water Purification Systems. Rather than resin beads, electrodeionization uses an electric field to remove ions from your water. No beads means no need to change them regularly, which gives EDI a significant advantage over ion exchange systems. EDI is often used, (as with ion exchange), in conjunction with reverse osmosis to ensure maximum purity. The water is first filtered to remove any large particulates, then treated with RO, and finally, through an electrodeionization field. Merck-Millipore guarantees water quality of >5 MΩ.cm at 25°C for most of their systems, however, they generally produce water at type II’s 10-15MΩ.cm range. Now that you have your ultrapure water, there’s a few things to consider. Firstly, water doesn’t like being pure. Like an (ironically) dry sponge, it’s going to want to soak up anything it can. You’re going to need it kept in some very specific conditions to ensure it doesn’t pick up any harmful impurities such as organic or inorganic compounds, dissolved gases, or microorganisms. This means your ultrapure water can’t be exposed to open air. This can be a rich source of contaminants such as carbon dioxide, volatile organics (if your laboratory uses solvents), acid fumes (if your laboratory uses strong acids), and of course, microorganisms. Secondly, the material of the storage vessel should be carefully considered. Depending on the purity of your water, certain materials may leach contaminants. Glass, for instance, can release silica and sodium. Polymers can release plasticizers. Metal tanks can release metal ions. Depending on the application you require your ultrapure water for, we would recommend selecting a storage option that releases the least harmful contaminants. Secondly, ensure that the inside of the tank is as smooth as possible. The reduced surface area will help lessen the amount of contaminants that can leach out of the container, and also make it harder for algae or bacteria to grow. The best containers we have come across are often sold to be used in conjunction with Merck-Millipore Elix® systems. Depending on your requirements, these come with a range of features (such as UV lighting to keep algae and microorganisms from growing, etc) to prevent re-contamination. However, in order to guarantee purity and accurate test results, it is still not advisable to use them to store ultrapure water for extended periods. The reality is; ultrapure water will eventually be recontaminated. It’s inevitable – there are simply too many ways that it can lose its purity over time. If you need a steady source of ultrapure water for your laboratory, you’re going to need to create it on demand with a water purification system of your own. It’s simply not feasible to buy in bulk, and use as you need it. If you’re looking for ultrapure water, storage, or a water purification system for your lab, we’d love to help you find the perfect solution. Give us a call on (03) 6216 1500, or get in touch with the team!